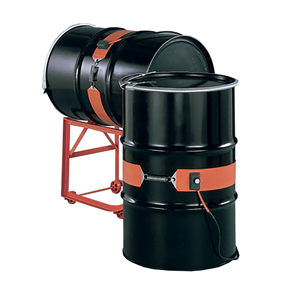 OMEGALUX™ Silicone Rubber Laminated Heavy Duty Drum Heaters are electrical resistance heaters in blanket form. They are designed to provide a practical efficient means of freeze protection, viscosity control, melting of solids and maintaining materials at elevated temperatures. OMEGALUX Heavy Duty Drum Heaters are totally integrated heating systems consisting of a durable, multi-strand nickelchromium heating element insulated with two applications of high temperature fiberglass yarn and knitted into tape form. These tapes are laminated between multiple layers of silicone impregnated fiberglass cloth. The SHDH series also features a dense grounding grid of tinned copper wire. The optional OMEGALUX™ Thermostatic Control combined with the low watt density serpentine heating element ensures even heat distribution across the entire inner surface of the drum heater and provides a positive prevention from hot spots and overheating sensitive products.